I'm fortunate to live in a fairly agricultural area, so the streets and markets are flooded with inexpensive local produce that is far and away better than the sad pinkish tomatoes shipped in from parts unknown. I love this time of year just for the amazing produce (not the 90+ degree temps!) and tend to lean toward fresh/raw dishes for dinners during the summer. Tuna is something I always thought I hated when I was growing up, mostly because the only way I had eaten it was in a mayonnaise-laden salad with some celery and onion halfheartedly thrown in. Then I was exposed to the deliciousness of fresh tuna in sashimi and sushi form and I was hooked. When my husband and I started dating he opened my eyes to the world of fresh tuna steaks and I've been a tuna convert ever since. This fresh tuna salad recipe is super-customizable, but I really love the Asian-style dressing and the flavor it brings to the salad and the tuna itself. I kept the salad simple with greens, cucumber and radishes but you could easily add in blanched green beans, peas or any other veggie that strikes your fancy. Pat fish dry, then gently brush both sides of each fillet with olive oil. Sprinkle both sides with the fresh rosemary, salt and pepper. To cook the fish, either grill it or sear it in a cast-iron skillet very quickly. I like my tuna steaks rare in the middle so it took barely any time at all to sear it off on all sides. While the tuna is cooking, make the dressing. You can also do this ahead of time and just store it in the fridge. Combine all dressing ingredients in a mason jar, screw on lid tightly and shake until completely combined. Taste and season as needed. 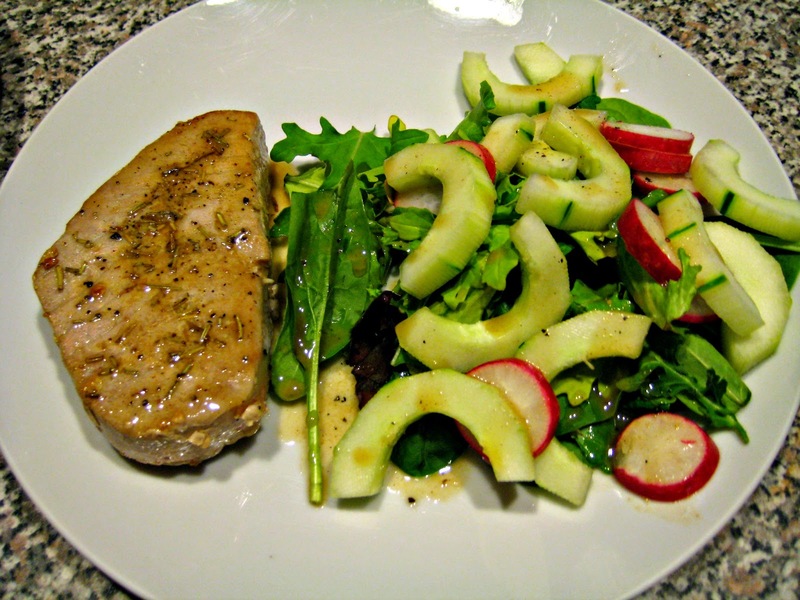 Assemble the salad greens, radishes and cucumber on plates, then add the tuna (either on top or on the side), then drizzle the fish and the salad with the dressing. Serve room-temperature.